We usually keep data on local drives or store files in the cloud in case our computers break down or if its operating system crashes and needs to be reinstalled. But there’s a simpler way to back up files and carry them everywhere: copy them to USB hard drives. Lately, USB hard disk drives have become very popular and Western Digital is expanding its portfolio with two stylish USB 3.0 models called My Passport and My Book. 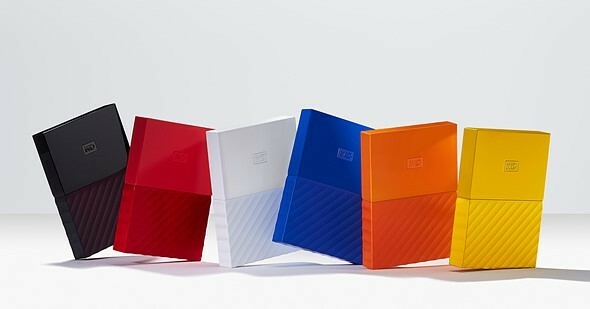 Western Digital specifies that “Each storage device comes with an automatic backup solution for a seamless, user-friendly process, as well as password protection to keep your precious data safe.” My Passport is available in six vivid colors: Black, Yellow, Red, White, Orange and Blue, but the variant for Mac comes only in Black. Its starts at $79.99 and features a 2.5-inch laptop drive which is bus-powered while the Mac version is formatted for macOS. Both versions sport a new attractive design and a textured bottom and offer up to 4TB capacity, password protection with 256-bit AES hardware encryption. the Windows model includes automatic backup with the included WD Backup software while the Mac model is Time Machine ready for easy backup. The My Book costs $129.99 and features a 3.5-inch desktop drive. If you opt for larger capacities, you will need external power. Its maximum supported capacity is 8TB and other features include password protection with hardware encryption and automatic backup with WD Backup software. There is no Linux support which makes it possible for all drives to be formatted in a file system such as ext4. Although backup software won’t work, there are many free open source options available for other platforms such as Ubuntu or Fedora.